Dumpling ride #4: steamed Thai dumplings at Aiyara Thai in Leesburg. These were a nice mix of pork, shrimp, and crab, with water chestnuts adding sweetness and crunch. Would order again. Given my current attempts to save calories and coins I think I'm just going to eavesdrop on this thread and salivate. I see some gyoza in your future, Kitty! In case you need some dumpling motivation here's a photo of Aushak, some Afghan dumplings at Maiwand Grill in Adams Morgan. Scallions, yogurt, mint, and ground beef sauce goodness. Steamed dumplings and wonton soup from the place next to the "Crystal City Restaurant". Pretty much what you would expect from the place next to the "Crystal City Restaurant". But after singlehandedly clearing the entirety of of the MVT with a child's toy, these dumplings were sweet succor. 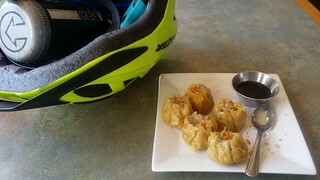 I rode to a nearby place I have never tried, enjoyed a small cup of Hot and Sour soup (good). The dumplings took a looooong time to arrive, but we're on a little bed of salad with a nice dish of sauce. The steamed dumplings were average, minced pork in wrappers. The sause was a good addition. Now I need to seek of better dumplings. Picked up "Dim Sum" dumplings (left) and "Szechuan Wontons" (right) from Tsim Yung in Del Ray. The dumplings tasted like Dinty Moor beef stew. Take from that what you will. The Wontons were bizarre, I guess they were once deep fried and then stewed in a spicy brown sauce to a tough and chewy consistency. I'll have no part of that again. A very windy ride over to the Yellow Mountain Tea House for the Most Amazing and Delicious Dumplings! Also a very nice tea brewing ceremony. We chose Beef Steamed Buns, Chicken Dumplings, Bean and Chocolate Buns, and Xiao Long Boa. Every one was excellent! So very much better than the first place I tried! Hannah especially liked the Bean & Chocolate buns. The bone broth soup Xiao Long Bao was delicious. Will come back here oftern! Review in a word: YUM! Last edited by Edelweiss; 02-05-2019 at 12:02 AM. Reason: Corrections.